When I was 13, high-waisted jeans were in style, just like they are today. People loved pop music and went to the movies on cheap night. There were high school dances and parties down by the river where you knew everyone was up to no good. Seems like a lot of the same things that go on today, right? In principle, yes, but this world we live in, there was no way our 13-year-old minds in 1990 could have predicted what today’s teens are living. Sure, back in 1990, everyone dreamt of the hover board and travelling to the moon but I don’t think we got the memo about how our world would be controlled by devices through a need for community, acceptance, anonymity and how much of a disease it would become in society if abused. 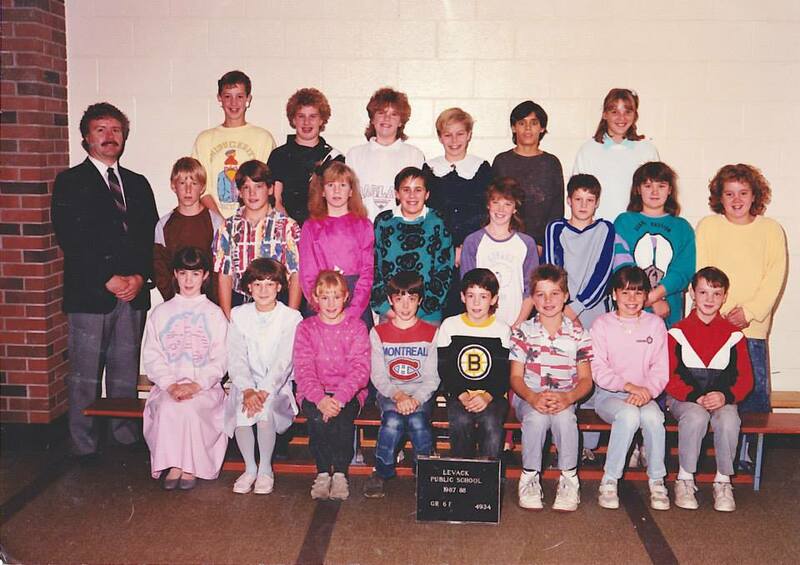 Class photo from 87/88, before we knew everything as teens and nothing as parents. The age gap between my oldest child and I is 21 years. Well, almost 22. The reason I point this out is because one year in this new world of technology is a long time. Even though I can relate to suede booties being cool, how chokers are coming back into style and daydream with YouTubers about what my college dorm will be like, I can’t relate to how quickly a thought can translate to a self-made video that is broadcast in near real time to a group of anonymous viewers for just a few seconds. Who is sitting there waiting for these posts? My kids understand social media far more than me, even though I have been studying media for years now. I blame it on my ‘old’ brain. 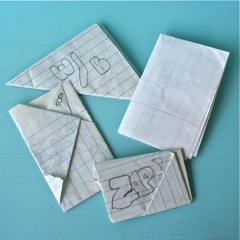 You see, I hate to do this to you but when I was 13, back in the day, we had special ways of folding notes and we used notes to communicate in school. For example, if you kissed someone and the secret got out a little more embellished than how it happened, you had a rumour contained within the doors of your school, amidst your peers, your judge-y, hormonal, irrational, insecure peers. The notes rarely got past the gates, probably because no one cared all that much. Not to diminish the bullying that went on in the past for teens but the pedestal of free speech is no longer contained in a little folded note passed around class, nor is it limited to the 15 minute phone call you were allowed before bed, and even if skeletons in your closet or rumours did haunt you for a bit, it wasn’t usually documented for forever and ever. Actual letter I wrote to a friend in March 1994, excited about new emoticons on the typewriter. Well now, things have changed and we are not in Kansas anymore. Kids are killing themselves, teens are exploiting each other, parents can’t keep up or have no clue and it is a whole cyber world that separates the generations. Let me share an example. My daughter tells me that Facebook is for ‘old people’. And I must confess, I think she is right. I tried Snapchat. I signed up and tried to add a couple contacts to see what they were doing. My daughter is a pro at Snapchat and Instagram, I might add. She adds a sun emoticon to a selfie and her Instagram blows up. Snapchat, I have no idea what she is doing. When we eat together, we have conversations as roommates and laugh and relate. And then she does this Snapchat thing and I feel like I should go stroke my proverbial beard and ponder philosophy in the corner or search for some new recipes. I don’t get it. I cannot understand the appeal as hard as I try! But I have to keep trying to learn because part of my job in this day and age is to know how my kids are communicating. I can’t put a time limit on them when they both have cell phones. Apps and social media sites change so quickly it is hard to keep up. I feel like a stalker when I check their pages but I can’t help it and part of it is because I want to see what they are putting out into this world. As a family, we have had numerous conversations about online safety but the older they get and the more confident they are in their social media use, a lot of times, their guard gets let down. Sometimes things get posted publicly and I text my daughter to make it private, things like that. I’m the online Post Police/Digi-Mom and I still feel like Rosco P. Coltrain. Recently, I watched an interesting documentary about how the privacy laws online have changed drastically in the last 15 years. This film states that Apple apparently changed its original user agreement to reflect edited new policies after 9/11, as if the first were never written. The documentary is called Terms and Conditions May Apply and it explores how when we agree to the terms and conditions for most online sites, we agree to give them our information. For any number of reasons, our information and private conversations, photos, our whole online lives can be recalled at any time. Even what we have deleted, it’s not gone, it’s cached somewhere and it will never go away. Youth have impulsiveness and it’s a blissful time when you know everything and care about nothing. One thing about those notes we passed around, better be sure your name was mud if someone learned you were talking about them and had the proof in your handwriting, cleverly folded. When I worked in insurance and investments, every digital package I touched had my name attached with a time stamp. Just in case. It’s no different now only technology has expanded to watch our every move online, in every day life. And since we are so dependent on our online communities, we accept that it is happening, turn a blind eye or figure we have nothing to hide. We teach our kids how to use a fork, we help them learn how to ride a bike, it is also our responsibility to help them navigate the online world, safely and educated. Anderson Cooper just ran a recent special on CNN called “#Being13 – Inside the Secret World of Teens” and it talked about how social media is affecting the lives of teens every day. One girl admitted to checking her social media at least 100 times a day. I don’t think she is alone. The reasons they gave for being so dependent on their devices is because the technology and devices were windows to self esteem, showing them likes and comments on their pages, having ‘friends’ tell them they’re beautiful or making sure no one is talking smack about them. Before and after the show, the hosts and cast posted photos of themselves at the age of 13 on Twitter, just to compare how things were to how things are. Even Cher joined in the fun and added her comments. Part of this explained why kids are so ‘addicted’ to social media. Would I have been addicted when I was 13 had it been around? Probably because I was obsessively into anything I was passionate about and my social life was at the top of that list. The #Being13 campaign made it clear that as parents today, we can’t fight social media, we have to accept that it is very important to our kids, to our world, it’s here to stay and the key is knowing how to use it and understanding how it works. Parents couldn’t control Elvis’ gyrations in the girls went mad; parents couldn’t protest the mohawk or the punk movement, although they tried. When Britney did it one more time, parents were wishing for Elvis’ hips and Blue Suede Shoes. Now Britney is the mom and the least of our worries is how our kids cut their hair. #Being13 is now a rapidly retweeted hashtag on Twitter as the campaign continues as blogs surface all the time about how to keep kids safe online. The New York Times published a recent blog post coinciding with Anderson’s CNN special with tips on how parents can help their pre-teens and teens start their social media lives right. The suggestions are fairly self-explanatory but the article goes into them with more detail. Don’t rely on your child’s own posts. Expect mistakes, and don’t expect your child to be you. I also think part of that ‘lurk yourself’ means to understand the tools your kids are using. You don’t need to be a Snapchat Superstar but at least know more than I did when I tried to get my first video message. The sound doesn’t work unless you tap it and if you miss it, the video is gone and the moment is over. That’s as far as I’ve gotten. We can’t hide our kids from the real world they live in just because we were born too late to understand it. Blackberry thought they were all good and smooth sailing until Apple overtook them. Now Samsung is giving Apple a run for their money. If you snooze, you lose. Those precious, influential, easily malleable teen years are of equal importance to those of infancy because we are helping grow adults out of babies. Guide them versus crushing their spirits. We have to teach them that what they do now could affect their lives forever but still trust them and give them the freedom to be the individuals they are growing into. I don’t know if I’d go back to when Madonna was a virgin even if I do think that was her prime. It still feels like the 90s were only 10 years ago. I’m in my late 30s trying to figure out what photo to post to Instagram at the same time as my teenagers. We are all learning this together only I have a PhD. in Skepticism and they’re online hippies. Maybe it’s me who will lose out, not being as open as them but I’m ok with that as long as everyone keeps their shirts on, their comments polite and their manners in tact. Those are things they didn’t learn online. Now to sign off, here is some classic Elvis for you as you think about the fact that this ‘provocative’ live performance of Blue Suede Shoes is now almost 60 years old. We’ll never get that pre-internet innocence back. Sadly even 1990 is long gone. If you liked this blog post or have an opinion, please leave a comment. Great post! The age gap regarding social media is massive, yet so small at the same time, depending – I could not have fathomed “Grandma being on facebook” when I was a kid, yet here we are today! Awesome post! I love the idea and you wrote it so well! Great work. The age gap that you bring out in this post is intriguing in many ways. Technology changes by the second and #Being13 will not be the same in another 15 years. It surprises me that the introduction of internet has brought about the change that people in late 1980’s did not even think. Even today, a year back certain apps like yik yak and tinder were trending. You wont hear any body using these apps as they are not cool and #Being13 will get harder day by day as we proceed in the 21st century.